China's renewable energy revolution - can it save the world? China has made strategic choices favouring renewables over fossil fuels that are still not widely understood or appreciated, writes John A. Mathews, Professor of Management, Macquarie University, Australia. 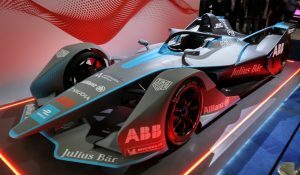 In this article he gives an overview of the latest trends in Chinese eletric power generation, which shows that the system is still “greening” faster than it is becoming black. But whether it is changing fast enough to save the world, is still an open question. Courtesy Asia-Pacific Journal. In this article I wish to take these arguments further and update the picture to incorporate comprehensive 2015 data as well as fresh targets for 2017 and 2020. 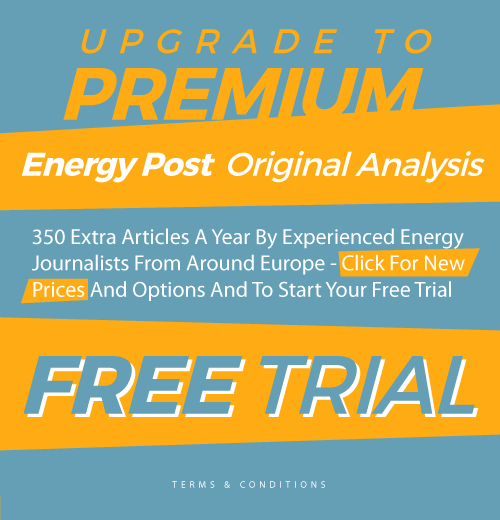 The context is China’s continuing battle to scale back its use of coal; its imminent release of the country’s 13th FYP for Energy, based on the overall 13th FYP for economic development over the five years 2016 to 2020, where new renewable energy targets will be announced or consolidated [See ChinaDialogue]; and China’s hosting of the G20 meeting in Hangzhou in September, where it will be promoting an international drive for greening of finance – with China itself playing a key role in this process. China is becoming a major promoter of international infrastructure development, in Africa and across Central Asia through the One Belt-One Road strategy – and this too carries strong implications for other countries’ energy choices. 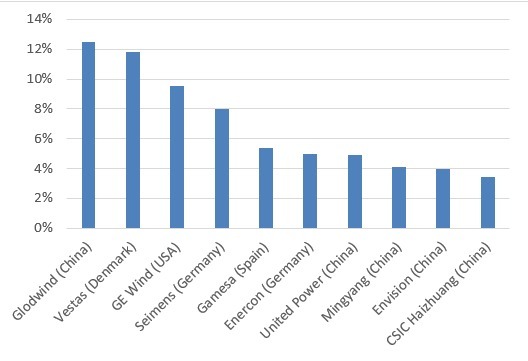 First, in terms of electric power generated, we find that total electric power generated by China in the year 2015 was 5,600 TWh (or billion kWh) – making China’s electric power generation by far the highest in the world. 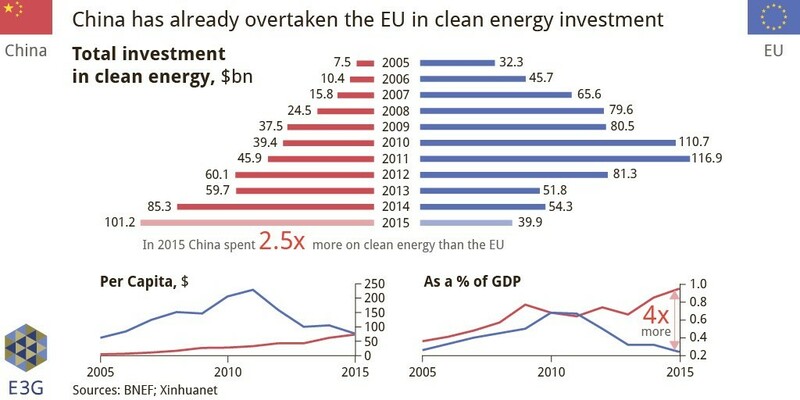 This total is flattening out, indicating that China is decoupling its energy consumption from economic growth. Each year the proportion of electricity generated by thermal sources (fossil fuels) declines; it reached just 73% in 2015 (meaning that non-thermal sources, mostly renewables, account for 27% of the electricity generated). 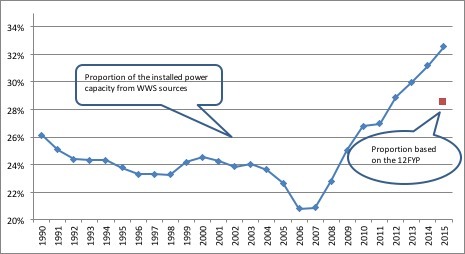 In fact, the power generated from thermal sources actually declined in absolute terms in 2015, down to 4,077 TWh – a decline of 96 TWh, or by 2.3% compared with the year before – and this for the second year in a row. By contrast, power generated from pure renewables (water, wind and sun) increased in 2015 by 116 TWh, to reach 1,362 TWh – up 9.30% on the year before. So power generated from thermal sources declined in absolute terms in 2015, while power generated from water, wind and sun increased. This is the clearest possible evidence that the leading edge of the electric power generating system is greening. 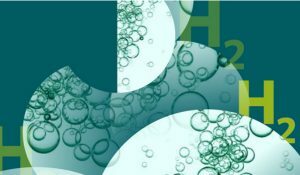 Nuclear sources also accounted for an extra 35 TWh, to reach 161 TWh – still a long way behind WWS (Water, Wind and Sun) pure renewable sources. Of course the system as a whole is still largely black – that’s what 73% dependence on fossil fuels means. But the trend, the leading edge, is definitely headed in a green direction. 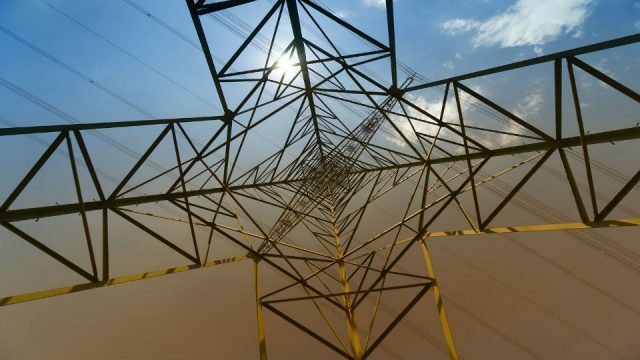 Over the past decade, dependence on thermal sources reached a peak of 83.3% of power generated in the two years 2006 and 2007, and has been declining each year since to reach just 73.0% in 2015 – or a 10% decline in a decade. 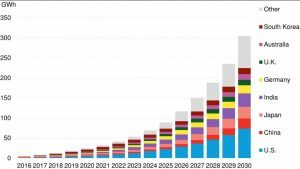 This is a remarkably swift shift for such a large technical system – particularly one that is growing rapidly – and is the basis for targets that see thermal sources accounting for just 63% by 2020 and less than 50% by 2030. By this time the total electric power system in China would be greener than blacker. The implications of these trends and data for coal consumption and carbon emissions will be discussed below. 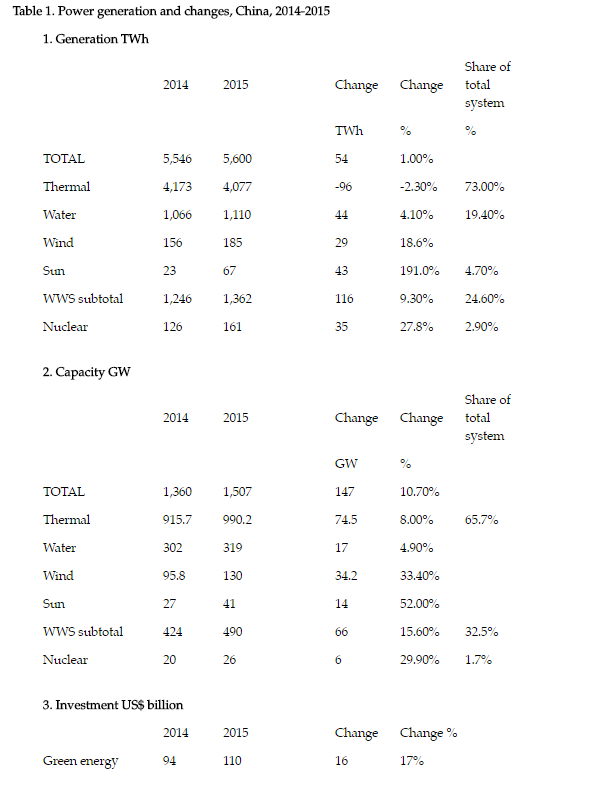 In terms of capacity added, 66% came from thermal sources in 2015 and 32.5% from water, wind and sun, plus 1.7% from nuclear, or 34% from non-thermal sources – more than a third. 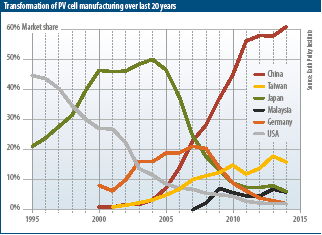 This demonstrates clearly how large the Chinese commitment to non-thermal sources of electric power has become. Now as in the case for 2014 data we have an immediate issue to explain in these statistics, which is how a system that adds thermal power capacity in 2015 (albeit at a low rate) can actually generate less power from these sources than in the previous year. 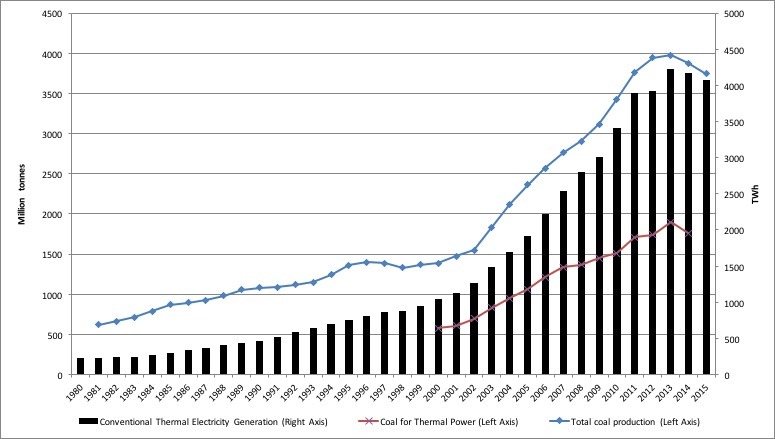 The answer is consistent with the explanation given by Tan and myself in 2014, namely that much of the thermal power capacity being added is actually not being utilized in generating electricity. 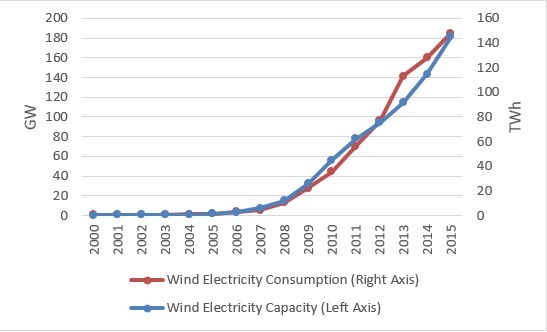 Figure 1 demonstrates a clear change in direction in China’s electric power system – with WWS generating capacity rising from a low of just 21% in the years 2006 to 2007 to reach 32.5% in 2015 – or more than a 10% increase in a decade. 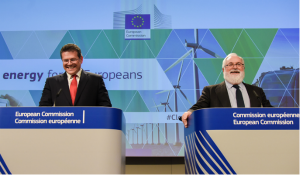 This is a rapid shift in the fundamentals of the electric power system – with China demonstrating to other industrial and industrializing countries that the green shift is feasible and that it can deliver economic, social and environmental benefits. Thirdly, the trends in terms of investment show a similar greening tendency outstripping the tendency towards blackening, or adding further coal-fired sources to the energy system. China’s investment in renewables sources of electric power in 2015 reached a world record of $110.5 billion – mostly going on wind farms, solar farms and hydro dams (including smaller hydro facilities, not just giant dams). According to Bloomberg New Energy Finance (BNEF), China’s investment of $110 billion accounts for no less than 33% of the global green investment of $329 billion in 2015 – itself a world record total. 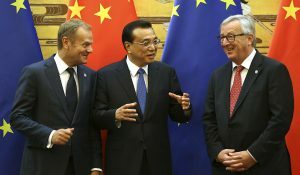 China’s investment matches the combined total of the next two industrial powers, namely the US ($56 billion) and the EU ($58.5 billion). The contrast with investment in thermal generating capacity is striking. According to China’s National Energy Administration, China invested 139.6 billion yuan (around US$21 billion) in new coal-fired power stations in 2015. This is less than a fifth of the investment in clean energy sources. In the same briefing on the electricity sector in China in 2015 the NEA revealed that investment in hydro amounted to 78.2 billion yuan (or US$11.7 billion) and in nuclear power investment was 56 billion yuan (or US$8.4 billion). So it is safe to say that China’s green investment in renewable power sources in 2015 well surpassed investment in thermal sources. This is a third indication that the leading edge of the electric power system is greener than blacker. The most arresting feature of China’s greening of investment in energy in 2015 was the introduction of green bonds as a major source of finance – a point to be returned to in a moment. Fig. 2 Source of primary data: The data for conventional thermal electricity generation is available from the China Electricity Council (CEC); the data for total coal production is available from the BP Statistical Review (2016) ‘Statistics of World Energy’; the data for coal consumption for thermal power generation is available from the National Bureau of Statistics, China. The scale of China’s build-up of green energy capacity is only appreciated when compared to what other countries are doing. Fig. 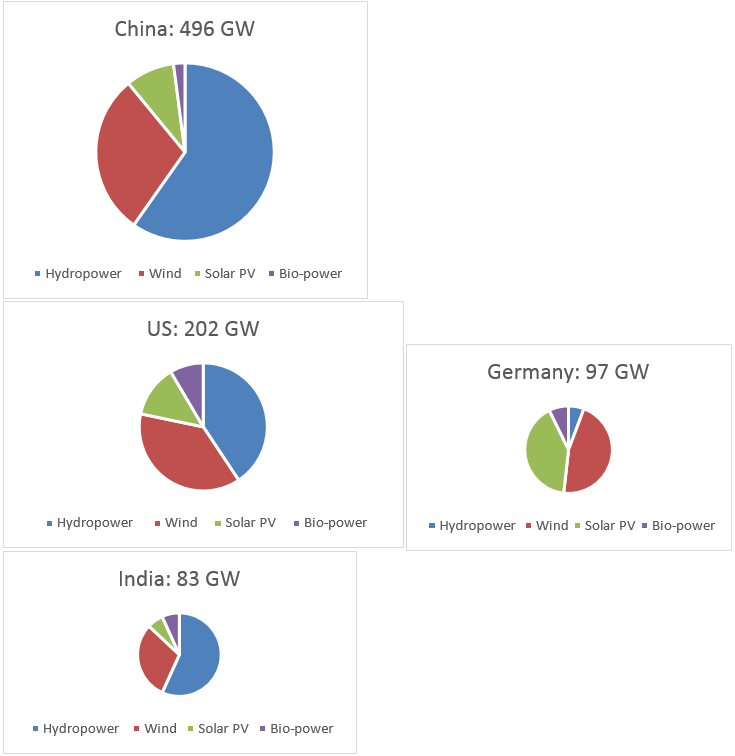 4 shows the situation in terms of capacity to generate power from water, wind and sun, in 2015, comparing different industrial countries.Note that this chart underestimates China’s real growth in wind power, as revealed by the official Chinese figures reproduced in Table 1. But we may use the data from the BP Statistics report as this is widely accepted. This article was first published by The Asia-Pacific Journal and is republished here with permission.